A bridge can be a portal, a passage, a strategic position, an arrival, a departure, or a place to meet halfway. And of course bridges can be marvelously romantic, as anyone who’s gasped at a mist-shrouded Golden Gate Bridge or taken a Parisian boat ride on the Seine can attest. 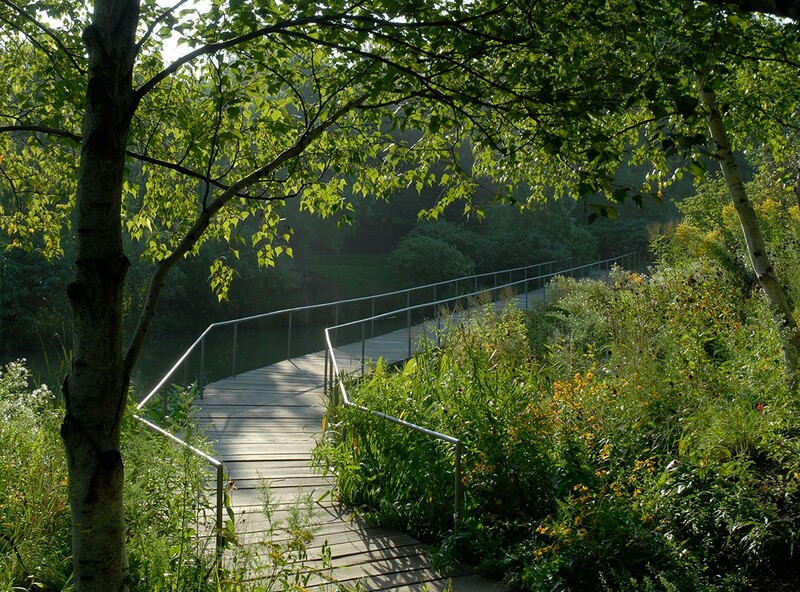 Bridges are integral to the Chicago Botanic Garden, too, built as it is on nine islands. For a lovely summer evening, take a long walk together…cross these six romantic bridges together…and prepare for some memorable moments. Bridges are one of the most spectacular places at the Garden for photography—as countless brides, prom groups, families, and sweethearts can attest. Sunset frames the Trellis Bridge in golden glow. 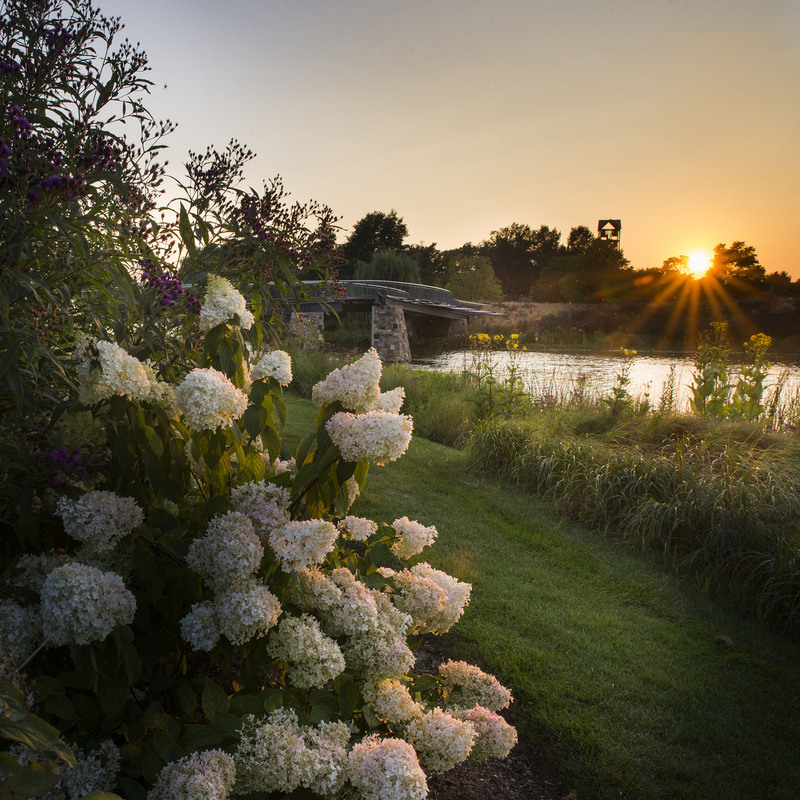 Halfway along Evening Island, the Trellis Bridge is a surprise invitation to explore what lies on the other side. The Trellis Bridge has different acoustics than the other bridges: it goes quiet at the center. Listen for the sounds of gardens, rather than the sounds of people. Its sinuous shape and curving boards invite you to pause…and enjoy each other’s company. 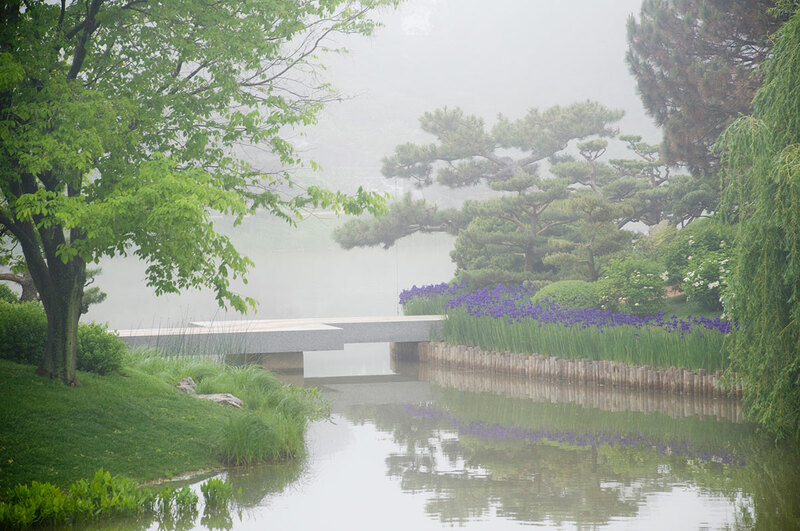 The serene scene at the Malott Japanese Garden bridge. Intentionally steep, the arched bridge that leads to the three islands of the Elizabeth Hubert Malott Japanese Garden forces you to slow down as you climb. At the top, you pause naturally to take a breath, to stop and lift your gaze, to look around, not just ahead of you. This bridge signals change—your passage into a very different garden and a very different mindset. In good spirits? Cross the Zigzag Bridge. 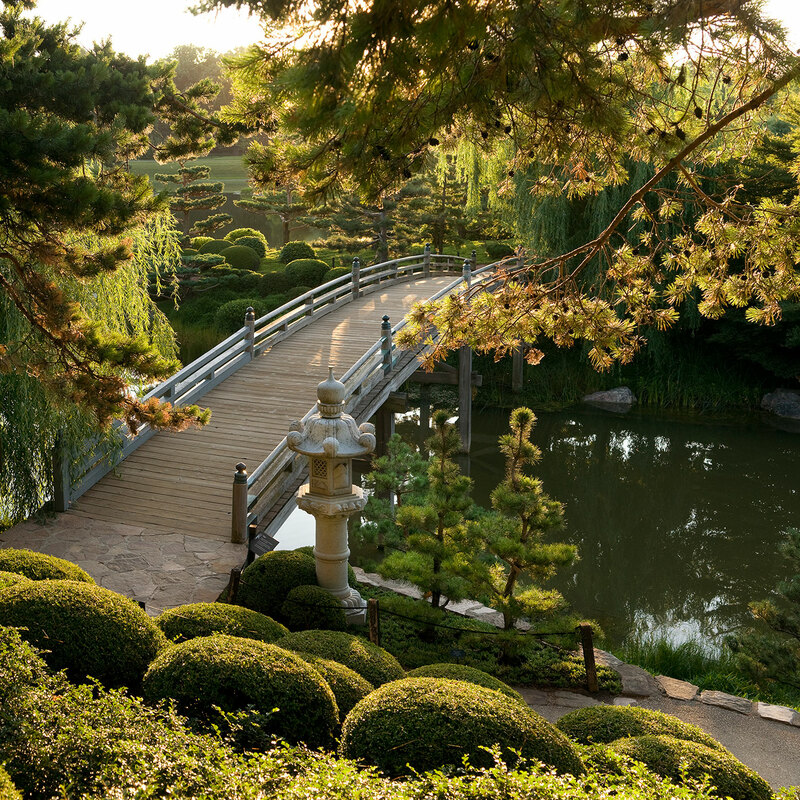 Separating two of the three Malott Japanese Garden islands is the Zigzag Bridge. While legend holds that humans can elude evil spirits by crossing a zigzag bridge (because those spirits move only in straight lines), a zigzag bridge also has a practical purpose: to slow your progress, encouraging you to enjoy the beauty around you…including your sweetheart. Lotus bloom in the shallows of the Arch Bridge in midsummer. Turn left as you leave the Malott Japanese Garden, and the very next turn brings you to the Arch Bridge, which connects to Evening Island. With its height above the water and its panoramic view, this bridge has a grand, soaring feeling. Plan to be there at sunset, when late light strikes and illuminates the bridge, making it—and the person you’re with—positively glow. Dine and dance every evening Monday through Thursday at the Garden to the rhythms of swing, Latin jazz, samba, bluegrass, big band, country, rock ’n’ roll, and salsa. Return to Evening Island and you’ll soon reach the Serpentine Bridge, which carries you back to the main island. It also brings you quite close to the water, as if floating above it. Meanderingly quiet and peaceful, the Serpentine Bridge feels very protected. Fish swim just below you, lilies and lotuses rock with the breeze, and the view toward the Arch Bridge at sunset is simply glorious. Bridges set the scene for what’s ahead, and the long boardwalk to Spider Island does that in a particularly brilliant way. Hand-hewn from black locust, the boardwalk bridges our largest island to our smallest, with an angled path lying low across the water. What could have been a short, direct, 90-degree crossing becomes instead a private journey to Spider Island’s sole, spiral path—like a tail on the curve of a question mark. Follow the path to its end, a small and private sitting area.